Virtual-Hideout.com: ASRock Launches Facebook Event to Win New Gen3 Motherboard! ASRock Launches Facebook Event to Win New Gen3 Motherboard! It's Time for Gen3-Show Yourself with "ASRock"and"3"
and win fabulous prizes home! Take a picture / video to show “You + ASRock + 3” in any Creative and Innovative way! 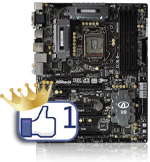 ASRock Facebook Event Wall will win the latest ASRock Gen3 motherboard! CLICK HERE TO JOIN THE EVENT RIGHT NOW!